When I was a young girl, I loved aquarium fishes. My family had a 100 gallon aquarium in our house filled with beautiful fish of vibrant colors and a variety of plants. This is why I decided it was time to get an aquarium in my own house. Buying an aquarium in Costa Rica can be a long process because you have find a store that has a large variety of fishes that are beautiful and healthy. This lets you know that the store takes good care of their fish which in terms lets you know about their fish knowledge and whether they care or not about their store. I first checked the internet looking for pet stores that carried aquarium fishes as well as aquarium stores in Costa Rica. I only found three stores that had an internet presence located in San Pedro, Belen and Guadalupe. The first and second store I visited were decent but just did not have that “Wow” factor and the fishes were overpriced. The third fish store, while large, had very sick looking fish and was a definite red flag. I ended up going to Facebook to ask people for help when I ran into the Atlantis Acuario facebook page. 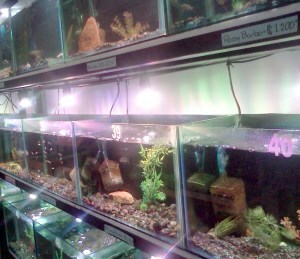 My first impression of this fish store was that even though it was modest in size, it certainly was well kept. A nice crowd was already in the store and one thing that I found appealing is that the aquariums holding the fish tanks were all nicely decorated, clean and had healthy looking fishes. I was greeted by a lady called Erika who happened to be the owner of the store. She was friendly and very professional. I told her that I was looking for a 20 gallon tank, filter, fishes and decorations and she got to work right away on helping me out. 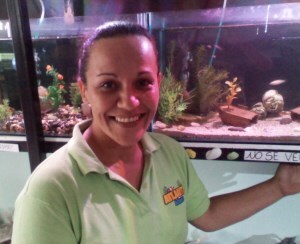 I liked how she asked me questions and preferences as it showed that she was not just trying to make a sale but really trying to find me an aquarium and fishes that would suit me best. In the end, she sold me a 20 gallon aquarium combo complete with filter, gravel, plants and even included drops so that I could almost instantly add the fish to the aquarium. In terms of cost, I thought it was a great deal since my total bill was around $200 which is about 5% cheaper than the other stores I had visited in Costa Rica. I did have a bit of luck because I had visited her store on a Saturday and on the weekends, she has a 2 for 1 promotion on certain fishes. She even gave me an extra ticket for her monthly raffle which is to win a 10 gallon aquarium that comes with everything you need to start your aquarium! 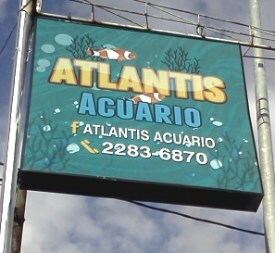 I will definitively come back to Atlantis Acuario to buy my aquarium supplies and possibly upgrade to a larger fish tank one day! Allison Kim is a world traveler who works part-time in Costa Rica realty and who is also an editor for CostaRicaAhorro.com. She loves to write, hang out at the beach and does a bit of modeling on the side.